In celebration of UWGB’s 50th Anniversary, UWGB Chancellor Gary Miller and Georgia Miller served as parade marshals. With help from the Dance Team of UW- Green Bay and UW-Green Bay Cheer Team, Green Bay Phoenix student-athletes, UWGB Alums, University of Wisconsin-Green Bay Phuture Phoenix and family of UWGB employees, more than 50 people marched together, handing out candy and celebrating with the projected 10,000 plus in attendance. 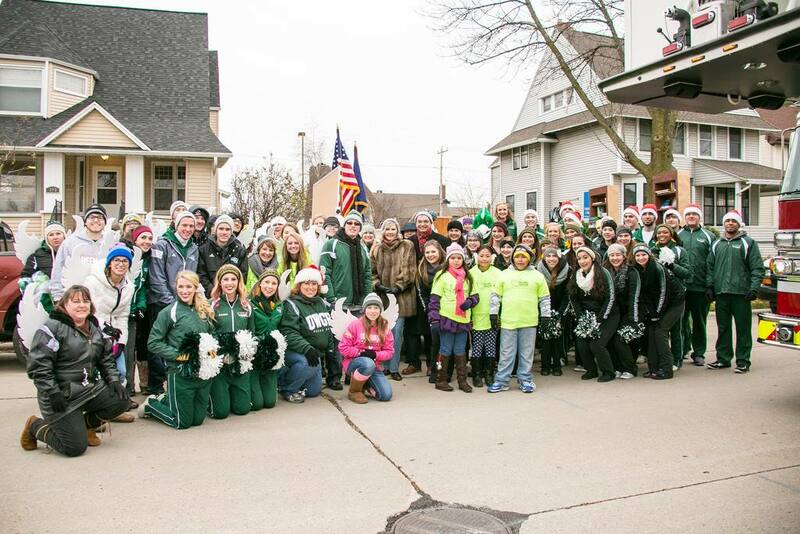 The Parade Committee also used the float for a service opportunity, collecting hundreds of school supply donations from UWGB faculty, staff, students and administrators, and local businesses, which will be donated in the weeks ahead to students in the Green Bay public schools. This entry was posted in Event Photos, News and tagged Green Bay Holiday Parade on December 7, 2015 by moodyk.